Gender gaps in employment, business, and access to finance hold back not just individuals but whole economies--at a time when we sorely need to boost growth and create new jobs globally. Leaders of the world are coming together in London this week for all the right reasons: As the violence continues unabated, stoking more turmoil in an already restive region, standing by the Syrians is unquestionably our collective duty. If we have learned anything from living in our increasingly globalized world, it is that no community or no nation stands in isolation. For better or worse, we are all connected. The International Organization for Migration reported this week that over 1,900 migrants have lost their lives so far this year attempting to brave the perilous sea-journey from North Africa to Europe. It's a record death toll -- over double last year's numbers -- within the context of a record year of migration. News that a madcap team of British adventurers have used snow kites to break the record for the fastest crossing of Greenland's ice cap reminds me of another record breaking journey by an even madder bunch of Antipodeans who use kite surfs to cross the Sahara. Floods and droughts in many parts of the world are getting ever more frequent and intense. Scientists have long warned that a changing climate is making such weather events more extreme. What is often neglected in the public debate is that the impacts of climate change on flood and drought disasters are exacerbated by environmental destruction. 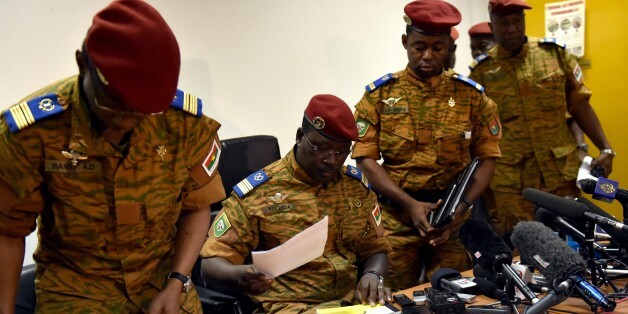 Only seven world leaders held office longer than Burkina Faso's president Blaise Compaoré before his ouster late last week, following chaotic protests in the capital city of Ouagadougou, when protesters set the parliament on fire before the Burkinabé military. If there was ever a J.R.R. Tolkien moment in the Libya conflict, it has arrived. The forces of good and evil are fighting the future of Libya. Most of these technologies and practices are not new, but their application by hundreds of thousands of smallholder farmers has been a major factor in creating impact at scale. This Fall, the Sahel region has become a center of international attention with the United Nations calling its security situation "alarming" and deploying 12,600 peacekeepers to stabilize the region. This aid is desperately needed. This year, hundreds of thousands of children lived because of this change in the global market. And because of UNICEF's volume purchasing, prices for therapeutic food dropped by nearly 10 percent -- math that equates to more children saved. Having survived the harsh conditions of the desert and peacefully and coexisting alongside the local populations for centuries, the current political instability and its consequences is yet another stress to this elephant population, already at the limit of its endurance. With a reputation for being charming, witty and funny in person, Rice is known for being candid and persuasive at the United Nations. She responded by email to interview questions posed by The InterDependent. Has France Won in Mali? For now, France has achieved its objectives, at minimal costs and to general acclaim. But the crisis is not over. As it unfolds, France will find that it is unable to influence the course of events as decisively as it has in weeks past. Founder, North Africa Risk Consulting, Inc. While foreigners are welcome in Algeria, they are made to understand that they are not only subject to the government's laws and its rules and regulations, but also to the state's broader objectives. What If We Sent 1 Million Books to The Gambia? Tom Warth, the founder of Books For Africa, has done a lot of unusual things to promote charity and education. But nothing has been as important to him as his "African Book Walk: A Hike Across The Gambia to End Their Book Famine." Despite the militant occupation in the north which bans the creation and enjoyment of music (even Tuareg music is banned in Tuareg land), and despite the widespread shortage of food and water, musicians will continue to sing. Ban Ki-moon, the Secretary-General of the United Nations, has appointed the former Italian Prime Minister Romano Prodi as special envoy to the Sahel region, which covers parts of Senegal, Mauritania, Mali, Algeria, Niger, Chad, Sudan, South Sudan and Eritrea.